Title IX Focus on Fundraising and Booster Club Follow Up Webinar now available on the OSAA website. Application due May 8. Interviews will be held on May 21. Please contact K.T. Emerson for application and questions. As weather changes this spring, please make sure your up to date on the Lightening Safety Guidelines. Now available for spring activities for member schools to purchase. The OnPoint Community Credit Union Scholar Program is now available. Order certificates today! Recipients are now eligible to apply for six college scholarships! Make sure to check out OSAAtoday for the latest news, coach polls, and stories. Summary from April 8 meeting. Includes two updated policies. Revised policy recently approved by Executive Board that aligns with Oregon State law. See where your school ranks at the conclusion of the Winter Season in activities and academics. Sponsored by Pacific Office Automation. Please make sure all coaches and administrators are aware of this date so any summer activities this year do not begin until Tuesday, May 28.
Review from their second meeting of the school year, including a request for feedback on several concepts. Schools utilizing the OSAA Foundation for ImPACT testing will receive invoices for usage the week of May 6. Subscribe to the weekly Round-Up filled with OSAAtoday stories! Checks totaling $224,331 were sent to 220 schools the last week of March. You are now able to input 2019-20 schedules for Fall and Winter teams. These forms are now open, deadline is April 12. All-Expenses Paid Summer Tour of Marine Corps Recruit Training in San Diego! See firsthand how Marines are made, what it takes to earn the title and, if you dare, experience these trials for yourself on the week-long trip. Learn more about the Marine Corps Educators Workshop. Educational seminar credits to be awarded upon completion of workshop. Read the latest in high school prep sports coverage! Constantly updated with information on Golf, Tennis, Baseball, Softball and Track & Field. Agenda and Caucus Items for their second meeting of the year. Registration is currently open, deadline to submit is Saturday, April 13. Update from their latest committee meeting. Remember that results from contests added to a team's schedule after April 3 vs. a team more than one classification away shall not be included in the rankings. NOTE: contests at tournaments are not affected by this policy. Reminder that unattached individuals may not compete against a high school team or individual at a high school event. Emma Lawless of Canby HS and Kayla Bolnick of Wilsonville HS honored by the NFHS. See where your winter teams placed overall and in their respective classifications! All district results are in. Director now need to input additional information for each potential qualifier (Deadline March 22). As we try to create a list of all artificial playing surfaces in the state, please review and reply if you know of additional fields or if listed contact information has changed. The Aspen Institute is conducting a national search to identify exemplary and innovative high school sports teams that model best practices for developing healthy athletes. The state championships, set for Friday and Saturday, have a new format this year. The online forms are easier than ever for schools to use. See link for step by step instructions. District event results due March 18; qualifier information due March 22. Are there students from other schools participating for you? Make sure they are signed up with the OSAA before participation. Please update the information on the OSAA website ASAP so we can communicate with your school personnel throughout the spring. We will be sending varsity head coaches a digital version to their NFHS Rule Book by the first contest date to the e-mail address in our database. Varsity Baseball/Softball schedules are due by March 11. You may also input winter 2019-20 schedules into the OSAA website. If interested in starting a program, contact Jean Hansen of Special Olympics Oregon. Check out the coverage from OSAAtoday during the Basketball State Championships. OnPoint Community Credit Union Academic All-State! Deadline is tomorrow (February 22)! Opens tomorrow! Registration closes April 13. Contact Kelly Foster with questions. Baseball, Softball, Tennis, Golf, and Track & Field information is now posted for the season. Please review these pre-season memos for your activity. Want the Big League Treatment? Enter now! UO's Jane Sanders Stadium to host state championships. Summary from their February 11 meeting; includes 3A, 2A/1A Baseball and Softball playoff allocations. Update from their latest meeting. Some key ideas they would like feedback on are included. Baseball and Softball Lineup Cards are now available for purchase. Extra rule books available for spring activities. March Madness returns to Portland! Buy tickets now for the Sweet Sixteen and Elite Eight. Constantly updated with information on Basketball, Wrestling and Swimming. Opens tomorrow! Registration closes April 13. Contact KT Emerson with questions. Take advantage of this 20% off coupon at all Oregon locations. Are you the best student section in the state? Upload your video for consideration! Deadline to submit winter teams is February 22. Apply for a grant (up to $10,000) to support initiatives in your school! Opens tomorrow! Closes February 8 at 4pm. Contact KT Emerson with questions. Update from their first meeting of the year. Provide feedback to Kris Welch. Please note that this calendar is DRAFT until approved on February 11. Les Schwab Tires and the OSAA will recognize a Team of the Month for each classification. Each winning varsity team will be chosen based on performance, dedication in the classroom, and service to the community. Each winner will receive a commemorative trophy and $100 donated to the team's program. 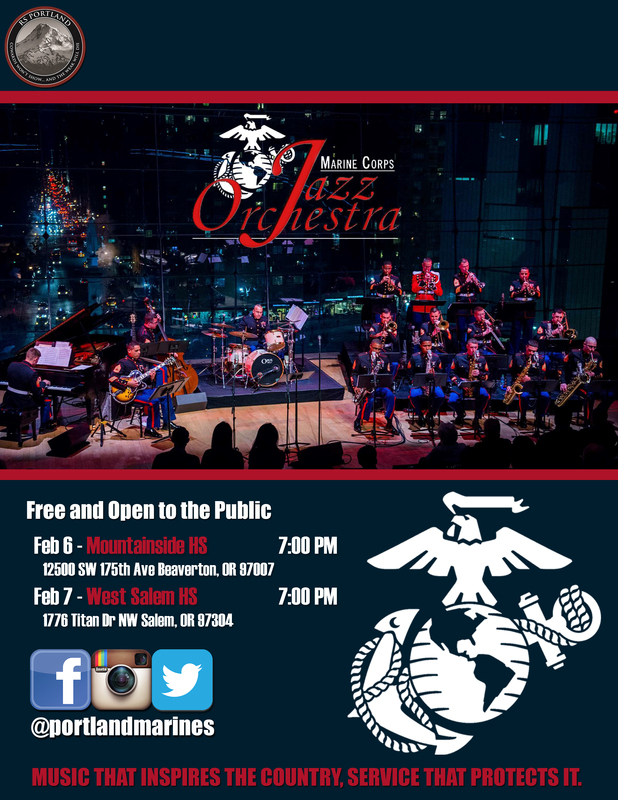 The premier jazz ensemble of the United States Marine Corps will perform February 6 at Mountainside High School and February 7 at West Salem High School. The association's youth football position statement hopes to bring programs in line with its safety guidelines. Agenda for their upcoming February 11 meeting. Follow up webinar from October to be held on April 3, 2019. See link to register. Please review and provide feedback to Kelly Foster by February 8. You've heard of the Letterman jacket, but have you heard about the revolutionary Letterman Bag? Finally a more useful way to showcase your Varsity letter year round! Go to www.lettermanbags.com and choose from over 30 color combinations to match your school! Use the discount code CarryYourPride as checkout. Verbal abuse blamed for shortage of officials. A reminder that a student may not practice or participate in a contest for more than six consecutive days without a rest day. The NFHS endorses two awards annually. Please see the NFHS Awards on the link provided for the Spirit of Sport Award and Heart of the Arts Award nomination forms. Now available for winter activities for member schools to purchase. The forms to submit your winter activities open Friday! The first full weekend of 2019 is full of intriguing storylines. Checks totaling $291,888 were sent to 211 schools prior to Christmas Break. See where your school ranks at the conclusion of the Fall Season in activities and academics. Sponsored by Pacific Office Automation. Please view and ensure your school is listed. Registration now open for the OWSLN Workshop on January 26th. Update from their latest meeting along with ideas they'd like feedback on. Deadline for submission is January 18. Remember that results from contests added to a team's schedule after January 9 vs. any team shall not be included in the rankings. NOTE: Contests not affected by this policy include bracketed contests at tournaments, league tiebreakers, and district/league tournaments. Update from their December 17 meeting. The organization awards up to six $3,000 scholarships. Update from their latest meeting. This new course on NFHSLearn.com is provided free of charge. Outlines what is permissible by NFHS rule when it comes to games played for charitable causes. Download the application for scholarships for high school seniors. Deadline is March 1. Submit Your Athletic Scholars for a Chance to Attend the Battles Won Academy by Dec. 31! High school juniors may apply for an all-expenses paid trip to our Nation's Capital this summer with a mentor of their choosing. Click the link to learn more. Memo is a review of OSAA guest coach guidelines and alumni practicing restrictions. Please notify OSAA by January 15 if you have Winter State Championship participants who may have a possible modification request. Fall 2019 schedules can now be entered into the website for the 2019-20 school year. The OSAA office will be closed December 24, 2018 through January 1, 2019. Happy Holidays! Summary from their December 3 meeting; includes a number of adoptions and first readings. Registration deadline is January 16 at 4pm. Reminders for basketball as the season ramps up. E-mail Kris Welch your holiday tournament brackets so the OSAA Website is up to date over the break. The Executive Board will wait until February to consider allowing five 1A-sized schools to join the Big Sky League. Remember that results from contests added to a team's schedule after December 19 vs. a team more than one classification away shall not be included in the rankings. NOTE: contests at tournaments are not affected by this policy. Please update the information on the OSAA website so we can communicate with your school personnel throughout the winter. New policy mandates varsity team sport rosters to be uploaded into the OSAA website. This is an exciting opportunity for students to contribute as writers and photographers. Contact Jerry Ulmer if interested! This document addresses OSAA policies relating to basketball pep bands. Get your NFHS #MyReasonWhy Posters by December 31. Reminder that EAP's are required of member school. We recommend the free program - Anyone Can Save a Life. The first all-female championship crew in 22 years sends a hopeful message for women to get involved in high school officiating. Agenda of the next Executive Board meeting has been posted. These districts are PROPOSED. Send feedback to OSAA prior to November 21. Update from their initial meeting. Next meeting is scheduled for December 10. Get back in the game and be part of the sport you love; become a sports official. Planbooks for the winter activities (Cheerleading, Swimming, Wrestling, Basketball and Dance/Drill) are now available. Along with winter schedules and rosters, schools need to update school/coach information. The NFHS endorses two awards annually. Please see the NFHS Awards on the link provided for the Spirit of Sport Award and Heart of the Arts Award. The sport looks a lot different than when the first OSAA state tournament was conducted in 1974. We encourage new AD's to take advantage of this opportunity. Extra rule books available for winter activities. See where your fall teams placed overall and in their respective classifications! Make sure to follow OSAAtoday for the latest in playoff coverage. Form has been updated and reposted. Supply Orders will shipped after October 29. Minutes from their October 16 meeting. Krossover is a film breakdown and analytics platform similar to other platforms like Hudl, but with more features and additional benefits. We've chosen to partner with Krossover due to their expanded feature set across major sports: Football, Basketball, Soccer, and Volleyball. As OSAA members, all coaches and athletic directors are eligible for free unlimited film storage as well as full-service film breakdowns. Click the link to get started today and to see how Krossover can help you this season with your film storage and breakdown needs! As the season wraps up, check out the final coaches polls provided by OSAAtoday. Summary from October 15 meeting. Includes a number of adopted revisions. Memo's addressing first contest date requirements and reminders for the 2018-19 season have been posted. Athletic Directors and Head Coaches should review this information prior to the first practice date. Many Title IX resources are available including a link to our most recent webinar focused on fundraising and booster clubs. October in Oregon is Fire Prevention Month! This is a time when fire service across the state joins forces to spread the word about fire safety. This year's theme from the National Fire Prevention Association (NFPA), is "Look. Listen. Learn. Be aware. Fire can happen anywhere." The Office of State Fire Marshal asks that Oregon schools consider increasing their fire safety lessons and resources to their students throughout the month. Enrollment figures with ADM adjustments from the 17-18 year. November 17 from 9am-3:30pm at Oregon Episcopal School. Register today! Now available for fall activities for member schools to purchase. Download the OSAA Live app! Stay connected to your team with the new OSAA Live mobile app. OSAA Live features the scores, schedules and rankings for all teams and leagues across Oregon. Search OSAA Live in the App Store or on Google Play to download today. Oregon small-school football's favorite sons. Remember some SAT and ACT testing dates conflict with State Championships. From the NFHS - Upcoming FCC bandwidth changes could affect your wireless microphone system. Information for Cross Country, Volleyball, Soccer and Football are now posted. Checkout the latest coaches polls that are posted for all fall activities. Agenda and Caucus Items for their first meeting of the year. The final recommendation will go to the Delegate Assembly on October 15. Krossover will be the Official Video Breakdown and Analytics Provider for the association. Krossover will bring unmatched game-film analysis and comprehensive statistical analysis for our athletic directors, coaches and students. Learn more during tomorrow's webinar at 1pm. Bolstered by donations from Nike and Adidas, the Foundation distributes clothing and gear across the state. Any game entered into the system after September 26 will not be counted in the rankings. Customize your Wilson Evolution with your school colors and logo. If your league is interested in receiving an OSAA update at one of your upcoming meetings, please contact. Please update your out-of-state opponent's records regularly. The first-year Bulls have only six players on their roster, all of them exchange students. Includes actions taken by the Executive Board at their first meeting. A workshop for building relationships and to get administrative specialists and secretaries aware of all the things the OSAA can offer towards making their jobs a little bit easier. Please notify OSAA by October 1 if you have Fall State Championship participants who may have a possible modification request. Please report all scores by 10pm the day of the contest. For volleyball, please do not enter any pool play matches/results. October 10, 2018 at 10am. The focus will be on Title IX compliance with athletics and activities fundraising and booster clubs. The forms to submit your fall activities are now open. How Oregon high schools got their nicknames. Update Varsity Head Coaches by September 12! We will be sending varsity head coaches a digial version to their NFHS Rule Book next week to the e-mail address in our database. These forms are due to the OSAA website by October 5. If you have students participating from Associate Members, their school must be listed prior to participation. Check out our Centennial Toolkit to follow along in your school and community. Items include a number of proposed rule and article changes. Insert your social media handles for your school and for individual programs! Take advantage of significant discounts as an OSAA member school. Each week throughout the school year, Wendy's and the OSAA will recognize varsity athletes that exhibited an outstanding performance during the previous week. From 2A Portland Christian to among the best in the world, Kim Hill continues to defy the odds. As temperatures stay hot and fires continue to burn, please reference this page to check if practices need to be modified in your area. Open to high school junior or seniors and college students. Deadline September 7. Confirm your coaches completed the Spirit Safety Certification. Information for Football, Soccer, Cross Country and Volleyball are now available. Moda Health congratulates Kellen Shelley (Grant Union) and Hadley Brooksby (Oakland) for winning these awards. The number of high school sports officials in Oregon has dropped 18 percent in the last eight years. Make sure all co-op forms are submitted and the co-op shows on your team page prior to August 23. Along with fall schedules and rosters, schools need to update school/coach information. Any person who wishes to assess wrestlers minimum wrestling weight will need to complete an online assessor profile form and attend an initial training workshop on Sunday, October 14 from 9am-1pm at the OSAA Office in Wilsonville. Memos for Football, Soccer and Volleyball are now posted. Each school gets one free rule book per activity, order additional ones here. Original Oregon high school activity content to appear on OSAA website. The OSAA is excited to announce that OnPoint Community Credit Union will be the title sponsor of the OSAA State Championships. Please update your coaches staff contact information for the OSAA to communicate throughout the year. Designed for all coaches to attend. $10 registration fee and will be held at Wilsonville High School. Walkups accepted. Includes action items voted on by the Board at their Summer Workshop. Sign up today to register for a required workshops. Need to change what you already signed up for? Simply re-register! Home school students must have taken the annual test on or before August 15 in order to participate in OSAA activities during the following school year. Spirit Safety Certification for Cheerleading and Dance/Drill coaches is now 100% online.